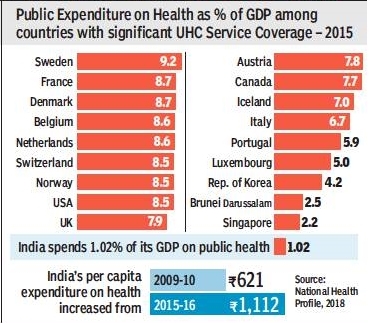 India currently spends a little over 1% of GDP on health, far below Singapore which has the lowest public spend on health at 2.2% of GDP among countries with significant universal health coverage service, according to latest National Health Profile data. India’s per capita public expenditure on health increased from Rs.621 in 2009-10 to Rs.1,112 (around $16 at current exchange rate) in 2015-16. However, it is still “nominal”, compared to other countries. Switzerland spends $6,944 on health per capita, whereas the United States spends $4,802 and UK spends $3,500. 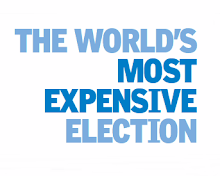 Even Singapore’s per capita expenditure at $1,183 is much higher than India. But this could change as the Centre plans to launch its ambitious National Health Protection Scheme-Ayushman Bharat- to cover over 10 crore poor families with an annual health cover of Rs.5 lakh per family. Modicare, as it is called, is billed to be the world’s largest such government-run insurance scheme. According to National Health Profile (2018), around 43 crore individuals or 34% of the population were covered under any health insurance in 2016-17. Launching the NHP, health minister JP Nadda said NHPS will significantly bring down the out of pocket expenditure on health. Total public expenditure on health in 2015-16 was Rs.140,054 crore.